If you were curious about the construction of the quilled art piece, If the Shoe Fits, Wear It, then this is the post for you. As promised, quilling artist Licia Politis has provided lots of information so we'll be able to picture how she went about making each component. The torso, handbag, and shoe work so well together. Wherever did you find the torso? The torso was a paper maché figure I purchased from Spotlight, an Australian haberdashery store. I inserted a small dowel through the base of the torso, up into the neck, and then fixed the dowel into the wooden base. I painted the base black and glued the checkerboard tessellation onto its surface. I was looking everywhere for a stiletto shoe as the ones here in the shops were old fashioned types with curved heels and tongues coming up the instep...not the look I wanted for this modern girl! I couldn't believe my stroke of good luck when I found this little ring holder on eBay and it arrived in just two days from the Northern Territory. It was the right size too, as the others in the shops were a bit bigger and too chunky to go with the torso and bag. 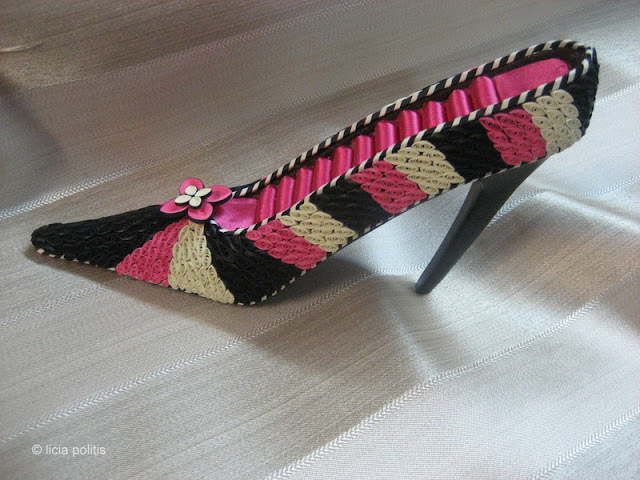 I painted the shoe's outer surface black before covering it with quilling. Rings can be placed between the hot pink satin ridges. The shoe measures 7 inches in length and 3 1/2 inches in height. I had never seen a little box like the handbag before, but it was as if it was made for this project! It opens part way and held a ring one of my girls received. By coincidence, the box was black cardboard on the outside and the inside was lined in hot pink paper. I added the pink material over the padded area which was where the ring was situated. It measures 3 inches across the top and is 3 1/2 inches in height. Working out the quilled design was tricky, as the pattern had to tessellate into the shape of the pre-made box. Just a piece of trivia... on the top area at the handle, there are 96 small pink cylinders... I think I had a bit of eye strain the day of gluing them on, something I'd not experienced before. I love how you did the black and white roping around the edges... did you wrap several stacked black strips with ivory? Yes, that's just what I did. This technique is called bandaging and was used in lots of antique quilling to define areas, especially in tea caddies. I only glued at the start and finish of the wrapping, as that allowed me to be able to manipulate the strip more easily when bending it around curved areas. 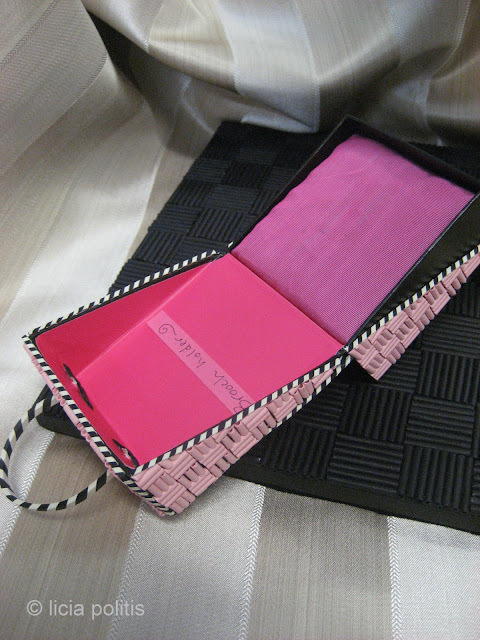 In some areas, like the handbag edges, I used 1.5 mm or 1/16th inch width paper (for both the wrapping and the bundle) and fewer black strips in the bundles, whereas the handle of the bag is 3mm or 1/4 inch black, wrapped with 3mm or 1/4 inch ivory. I repeated the bandaging throughout the piece, with the idea that the technique/patterning would bring it together as a whole. Each component, except the jewellery, features bandaging. Thanks so much for your explanation, Licia. This is unbelievable, Ann! I've read both of your posts (twice) featuring Licia and I'm speechless. This has got to be the mother of all quilling projects I have ever seen. Anytime I need inspiration, I can find it on your blog. Thanks for showing these fabulous artists. Thanks Molly, what a lovely comment.